The picture on the left is actually a joke related the topic of discussion here. It’ll make sense soon! Russian Dolls, also known as Matryoshka Dolls, are wooden dolls that are placed inside one another. You can read more about them here. Back in the late 1800s, Set Theory was really picking up pace and mathematicians were getting really intrigued by this field. They were devotedly working towards formalizing this field of study. The problem was that there were many loose definitions floating around and there wasn’t any concrete work towards formalizing it. It all started when naive set theory was being used to discuss the foundation of mathematics. Instead of describing set theory with formal logic, people were describing it informally using words. So why should we care about that? What’s wrong with using words to describe set theory? 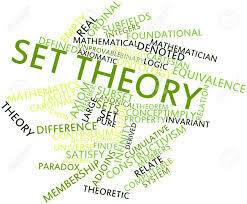 Why on earth would I care about “set theory”? Set Theory is one of most fundamental fields of mathematics. In fact, it is so deeply rooted in everything that it’s almost impossible to imagine the world without it. It is used extensively in cryptography, computer programming, internet security, communications, networking, and so on. You already know what a set is! A set is basically a collection of objects. It can either be a collection of brown colored rocks or a collection of countries with a population of less than 50 million. Back when set theory was becoming popular, people thought that anything can be converted into a set. Sounds like it’s a real possibility, right? I mean, since the definition is so broad, we can pretty much convert anything into a set. Most of the mathematicians around the world thought this way too. 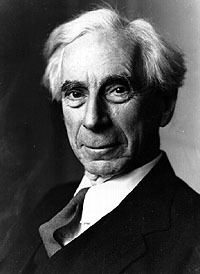 Bertrand Russell is a Nobel prize winning mathematician, logician, and a writer. While the whole world was thinking that anything can be turned into a set, he came along and presented them with a paradox. Let’s consider the following example. Let’s take a set ‘S’ that contains all the sets that do not contain themselves. Basically, if a set doesn’t contain itself, it is a member of the set. For example, the set of all car companies can be a member of this set because this set doesn’t contain itself. Now, we can see that ‘S’ is infinitely large because we can form an endless number of sets like this. Okay, so we have a nice big set now! This set is supposed to contain all the sets that do not contain themselves. We also know that ‘S’ doesn’t contain itself. Oh wait, so ‘S’ should be a member of the set by definition, right? ‘S’ doesn’t contain itself and ‘S’ is supposed to contain all the sets that do not contain themselves. So ‘S’ deserves to be in this set! Let’s go ahead and add it. But if we do that, then ‘S’ will contain itself. This means that we will violating the basic assumption that ‘S’ is a set of all sets that do not contain themselves. Do you see the problem here? This is called Russell’s Paradox. 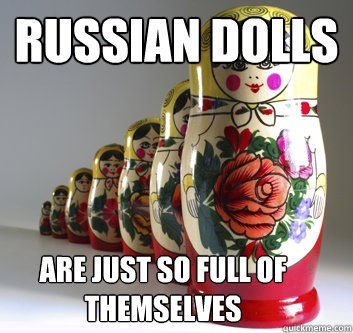 Can you now relate this to the joke about Russian Dolls in the main image? Alright, it’s a paradox. So what? This paradox was so significant that they had to completely change the fundamentals of Set Theory. To be fair, the paradox was discovered simultaneously and independently discovered by Ernst Zermelo as well. Both their formulations led to two of the most prominent fields in mathematics. Russell’s work led to the formulation of Type Theory and Zermelo’s work led to the creation of Zermelo-Fraenkel Set Theory, which is free of all the paradoxes. Type Theory is a branch of study that serves as an alternative to set theory in mathematics. It is so powerful that a whole new computer programming paradigm called Functional Programming was developed based on its principles. A whole new class of modern programming languages were developed as well. The reason it is so powerful is because of the strong mathematical foundation and its inherent ability to reduce bugs. Some of the big tech companies like LinkedIn, Twitter, Netflix, etc have heavily shifted towards functional programming in recent years. This is one of those classic “he was way ahead of his time” moments. Bertrand Russell invented something and it took around 100 years for people to realize how powerful it is! This entry was posted in Mathematics and tagged Set Theory, Type Theory by Prateek Joshi. Bookmark the permalink. It says : “- – – The problem in the paradox, Bertrand Russell reasoned, is that we are confusing a description of sets of numbers with a description of sets of sets of numbers. So Russell introduced a Hierarchy of Objects : Numbers, Sets of Numbers, Sets of (Sets of Numbers), etc. “¿” denotes an Empty Set ie, a Set with No Elements. But my Q : Thus / So, pl confirm that “¿” is NOT a Null Set ? “- – – In Probability, we think of Events as being Sets of Outcomes, and so, a Collection (Set) of Events would also be a set made up of other sets. Once they started Nesting Sets inside of other sets, the early set theorists considered an intriguing proposition – could a set contain itself as a member ? This comes about naturally from our open-ended, naive definition of a set. V Good Example this : We have the set of all natural numbers. So, it makes sense that we would also have the set of everything that is not a natural number. This set would include quite a few things – the numbers -3, 1/2, and π are all not naturals, and so they would be members. The word “pizza” is not a natural number, so that would be a member. The state of California is not a natural number as well, so we would throw that in there too. Since THIS Set is itself pretty clearly not a natural number, but instead an enormous collection of everything ever that is not a natural number, it must be a member of itself.